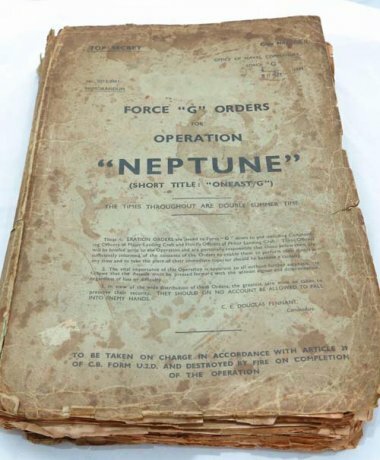 This original Force G Orders Book was issued at the end of May 1944 and would have been used for the planning and briefings of Operation Neptune for the GOLD beach sector. The orders book was final part of the planning stage which was the actual instructions for the complete operation. Over 800 copies were issued to officers and landing craft captains, like all BIGOT documents they were serial numbered so it is possible to see were all the copies were issued. They were delivered in sealed envelopes with strict instructions not to open until told to by the high command at Southwick House, which would have probably been around 3-4th June. The information inside the book is presented in chapters, overall objectives, build up, loading schedules, mooring locations, sailing times, assault timings and D+1 timings. Basically who, how, where and when. Each individual chapter was serial numbered to the book. It was instructed that each individual should only read and understand the sections that related to their individual objectives and once this was done to destroy the book with fire. The British approach was to produce this massive book with everyone’s instructions enclosed, the Americans took a very different approach in the fact they produced smaller more individual orders for each operation. An example of this would be the Mulberry orders which are also held in the collections archives. BIGOT documents are rare and BIGOT order books are even rarer because of the small distribution numbers and the fact that most were destroyed after use.